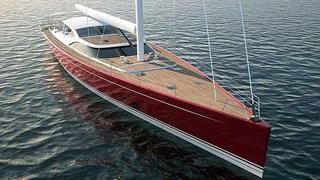 Baltic Yachts announce their second contract in 2012 after the one of WinWin in June, but this time for a 35.5 metre sailing yacht. Signed last summer, the Baltic 116 is a high performance cruiser with naval architecture by Judel/Vrolijk & Co and exterior styling by Nauta Design. She will have a raised saloon, and her cockpit will be protected by a carbon-fibre hard-top. Advanced technologies and materials will be used for the construction, such as carbon composite for the hull and a lifting keel. A priority will be to reduce noise and vibration and improve comfort. The interior, by Nauta Design also, will accommodate eight guests in four cabins, including a master suite forward. Crew quarters will include three cabins. Managed by Nigel Ingram at MCM, the construction of the Baltic 116 will start in January 2013 and her delivery is scheduled for October 2014.